I’m currently working on the Library and will be moving on to other Ground Floor rooms after that. Rather than making any of you wait for an entire floor to be completed, each room will be given to Derek upon it’s completion for him to present it to you here at the WHM. I will be calling upon you folks regularly for opinions on specific details and also help with providing color photos. I’ve already had help from some of you. Thank you! The White House Historical Association has a supplement to the Historic Guide 22ND edition [PDF]. Some great photos here, especially one of the Lincoln Sitting Room I’ve never seen before! The Lincoln Sitting Room looks great, and the President’s Dining Room is beautiful, altho I’m not crazy about the O’Keefe. There are also some nice photos of the West Wing rooms. The WHHA site has been somewhat redone. While I was there I ordered a couple of the WHH journals I didn’t have yet. I changed the front page to one of the West Sitting Hall around 1937. 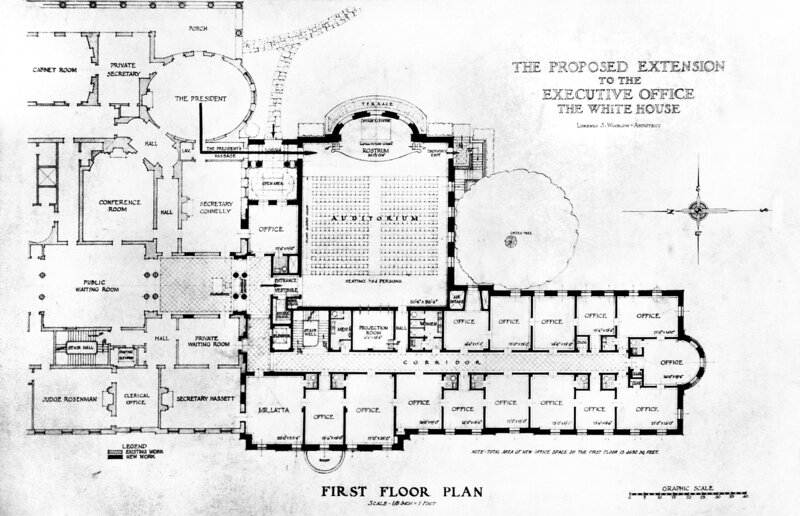 Also, I noticed that in the Truman 1945 renovation plans for the West Wing (which were never realized), there was a better layout for the first floor than I had for anywhere near that era, so I combined it with the 1960 plan to create a composite that should be pretty accurate (if not entirely complete on the north side).